I am a little sad about our trip to the Alma in Crystal Palace last Sunday. We've been to this pub several times in the past and while it never really blew me away, I always felt it was a nice pub to go to and meet up with friends. The food is nice and the atmosphere, while airy, still terribly cosy. It's located conveniently in the middle of Crystal Palace and is the perfect place to go to after a stroll through the park or a rummage through the numerous antique and second hand shops. Last Sunday my friend Anette was over from Newcastle and because it's her birthday on Friday, we thought we'd treat her to a relaxed Sunday lunch at the Alma. Our French waitress was a little dappy but sooo friendly, made us feel extremely comfortable and moved our booking to the sunny beer-garden without any problems. 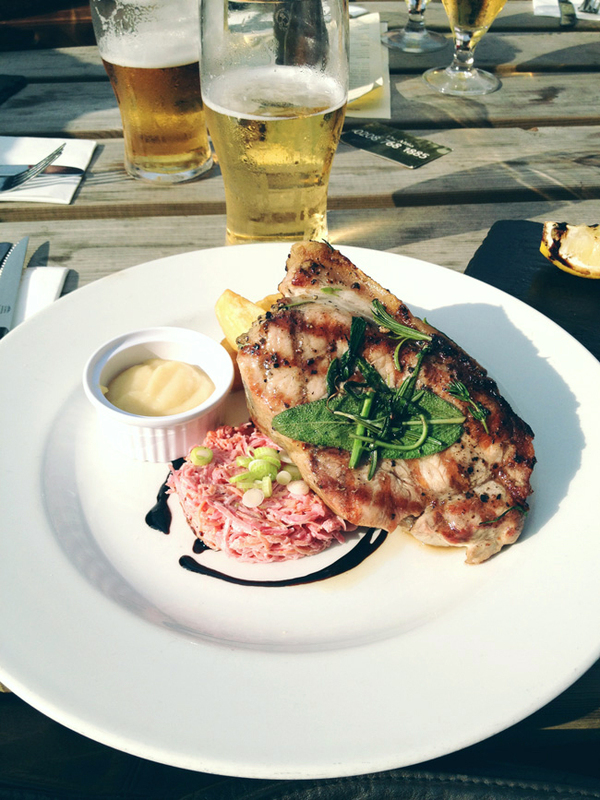 The Alma is currently serving both their regular menu of Sunday Roasts, Burgers, Pies and your usual pub grub as well as a lovely BBQ menu which includes a selection of starters and mains. 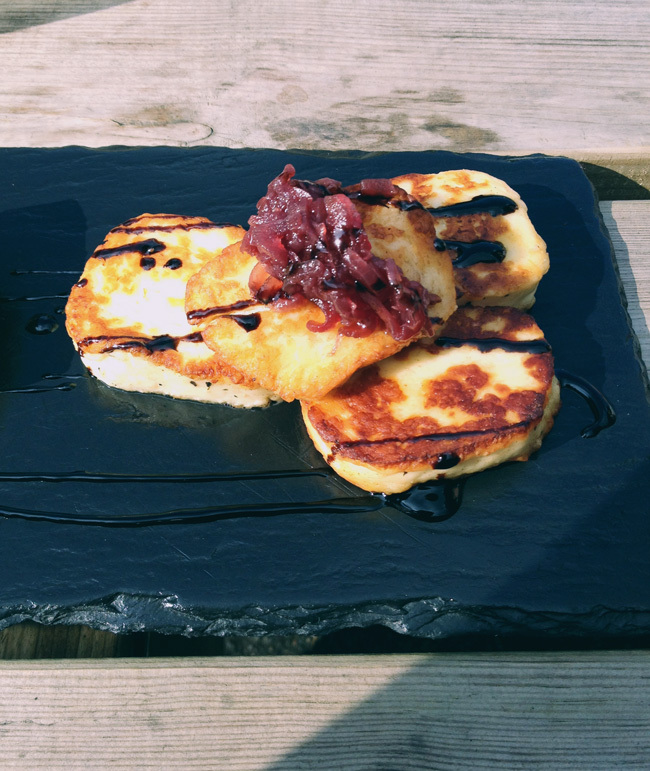 We all shared a starter of Halloumi with caramelised onions and a balsamic vinaigrette, which was very yummy indeed and a great way to start our meat feast. For mains we had: Hereford Beef Burger and Chips, which was tasty, well cooked and seasoned but nothing special. The pork steak with herb butter, coleslaw, chips and apple sauce was meant to come with crackling but unfortunately there was only a fat rim on it (tasty nevertheless). The coleslaw was a little warm for my liking but tasted ok and the chips were a little undercooked but tasted nice. Oh and what was going on with the apple sauce. Definitely jarred, I am certain that this was meant to accompany a dessert and not a pork steak (cinnamon overload is all I am saying). 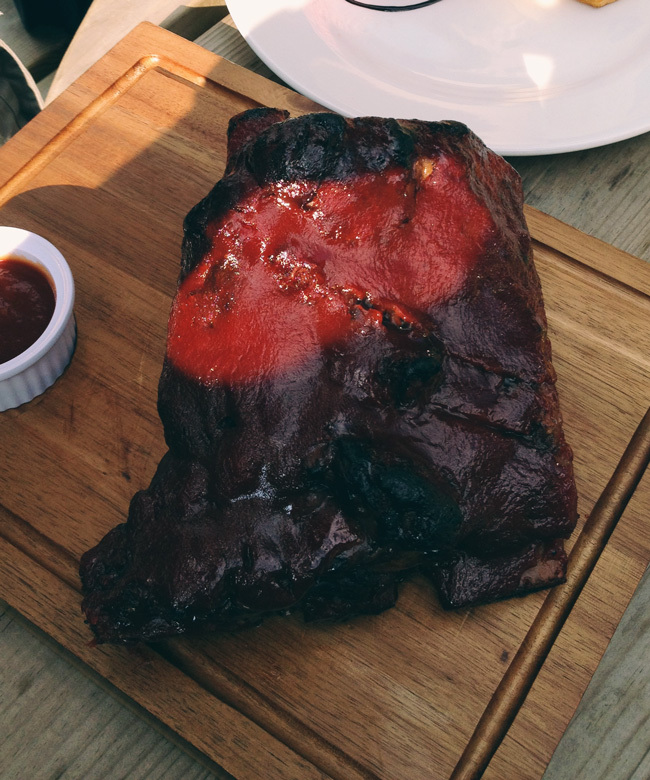 And then there were the Beef Ribs... which were absolutely huuuuuge and smothered in copious amounts of BBQ sauce!! Again, tasty but extremely difficult to cut and slightly on the tough side (little tip here, pre-boil you guys!). We washed down our meal with lager shandies, ciders and bitters which were all very nice and then it came to paying. Our bill came to just over £100 which is a little on the expensive side considering the food was good yet nothing special and we only had two starters among five of us and no desserts. But what really put me off and ruined this lunch for me was when I inquired about the fact that I had been charged for a full Heineken while I only had a shandy. The fairly snappy answer was that all pubs have started doing this and that they didn't charge us for a lemonade (yes but you charged me for a full pint of beer when I only had half). At £4.20 for a Heineken shandy I am more than disappointed and will definitely start ordering half a lemonade and half a lager from now on. Please don't think I am being tight, I have no problem paying a fair share if I am offered quality but it makes me sad to see all these nice places open in new and upcoming areas and justify their prices and mediocre quality with nothing really but the fact that they are "trendy". 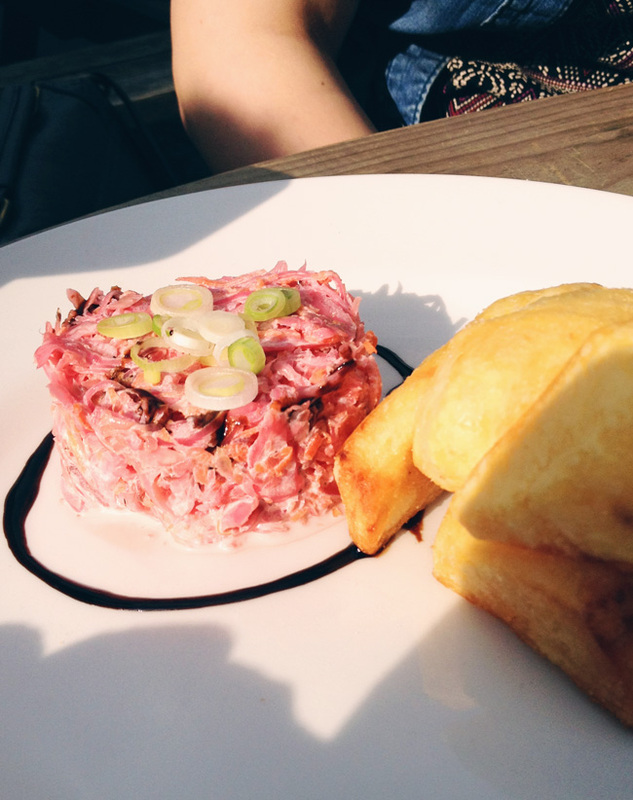 I am still encouraging you to go to the Alma as it is a nice pub with a good drinks and food selection. Too bad it turned out that way. I totally understand what you mean: trendy doesn't always equal quality.